Serve your signature sides and desserts in this Choice 7.25 oz. Ivory (American White) rolled edge china bouillon cup! 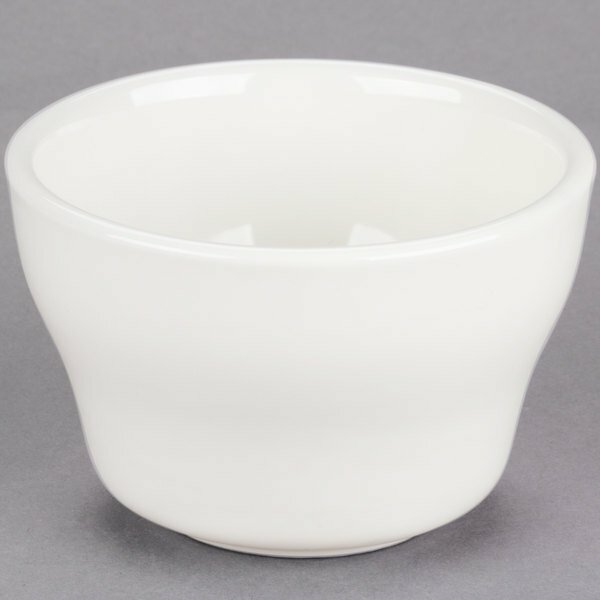 Perfect for smaller portions, this rolled edge china bouillon cup is great for restaurants, diners, and cafes. 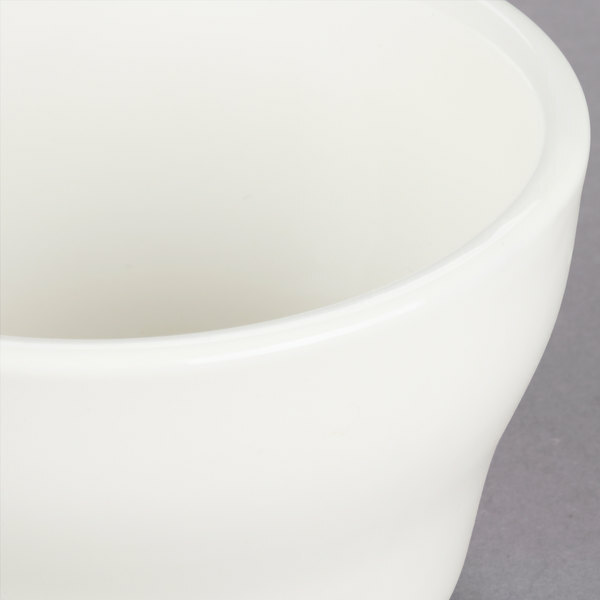 Sporting an elegant design, this bouillon cup is sure to accent any decadent side you place before your patrons. Plus, the ivory (American white) color complements any table setting or restaurant decor to accent your theme and make your food shine. "This is a hard working bowl shop. It is held up too many uses, and has survived even the most careless staff that we have. They wash up very well, look great on a plate and does the job we purchased it for." Made from durable china, this bouillon cup is capable of withstanding chipping and scratches to give you years of dependable service. Each cup can be stacked, allowing for optimal and efficient use of your storage space. Boasting a rolled edge, this bouillon cup elegantly frames your food to enhance the presentation while also helping to minimize any spillage that may occur during service. Thanks to the round and sturdy base, this bouillon cup will sit securely on saucer plates and tables to help eliminate worry about spills and messes. We love using these for our French dip sandwiches. We also put side dishes in them such as vegetables and cheese curds. The only downfall is they disappear over time. This is a classic bouillon cup. Perfect for a side cup of soup. They are really well made and hold up well to daily wear and tear without chipping. They are also a good size to hold things like butter packets or creamer packets on the table. We use the ivory china bouillon cup to present dips and cups of soup to our guests. Rather durable and does not break or bust in the dishwasher. Perfect for a cup of soup. These are well made and resist chipping. They look clean and bigger than what they actually hold. Recommended and nicely priced! These are the perfect size for a soup cup at our restaurant. They look nice and are affordable, so for us it was a win. Bouillon cups make everything look fancier. These particular cups are durable, easy to clean, and look good. The American White is, in my opinion, the better option, since they show less wear. You can use these cups for just about anything but we like to use them for tomato soups and cups of fruit. Really helps with proper portion control in the restaurant. We used these for a special fall wedding for the butternut Squash soup. they looked so great that the bride feel in love with the presentation. Durable product that doesn't chip easily. We use the product daily for soup and the thickness of the product's material protects our customers from any burning due to the hot substance inside the container. We wash daily through a high temperature dish machine and have no complaints on the products durability and reliability. Choice is a great brand of dinnerware. Love the bright white color and the heavy duty nature of this china. The 7.25 ounce cup is great for serving beans, cole slaw, and soup at our diner. Perfect bowls for soup or a side of veggie or coleslaw. They are very good quality and are not heavy which is nice for servers. The price is great for the quality of the items. perfect size for a soup cup and keeps the soup warm because of the thick walls. The color stays bright white and does not discolor. We purchased these soup bowls to help improve the serving temperature of our home made soups. The residents love these easy to eat out of bowls and they keep the soup nice and hot! I work in senior building and we have a lot of half portion people here. So when we have soup this is the right size for this. These cups work tremendously for a variety of applications: dips, soups, chili, slaw. We use them on about every plate and they stand up to a lot of abuse. Great value. This is a hard working bowl shop. It is held up too many uses, and has survived even the most careless staff that we have. They wash up very well, look great on a plate and does the job we purchased it for. I absolutely love this website!!! I can not get over the pricing for your items! They are so much cheaper than elsewhere. And this particular item is a way better quality than at other places and half of the price too! As long as you have what I'm looking for you will always have my business! GUARANTEED!! The order I placed tonight is my 3rd order with you since I have found you! lol. I love, love, love, this website!!!! Love these soup cups. They match up to what we have and the price can not be beat. Shipping costs were lower than expected.. Thanks again Webstaurant. we use this cup for our homemade soup. It is perfect to use, very thick and not too heavy on the trey to serve. Very pleased. We loves these Bouillon Cups! We use them for Au jus for our sandwiches and for Sauces. We also use for a cup of soup. Very sturdy and they last for a long time. We ordered these to see if they would match our existing banquet soup bowls, which they do not. The rim is a bit wider than our current style, but we think these look great. These are a nice bowl and we will consider switching to these in the future. 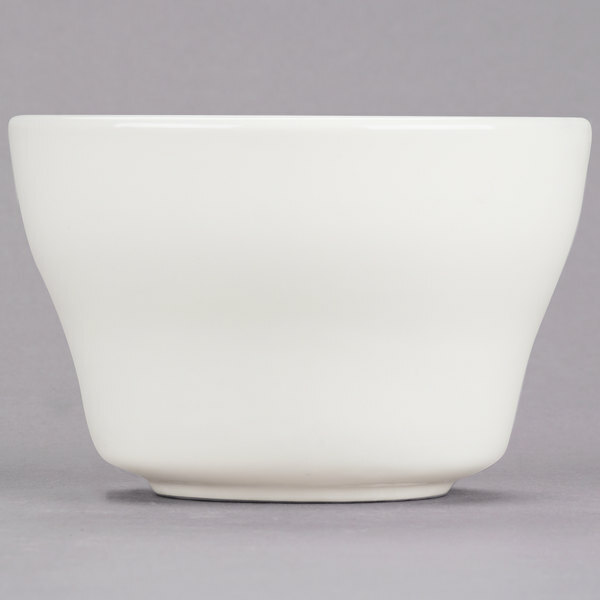 The American white 7.25 oz bouillon cup was a very close match to what my customer was currently using. Three dozen to a case, a great price, and none broken - what could be better. These bouillon cups are perfect for our delicious soups! Sturdy yet light weight all for a great price. Perfect for elegant dining or just a nice cup of soup on a cold day. These are nice standard off white colored cups. We use them to serve au jus with our steak tips and french dip sandwiches. Good for small sides of coleslaw and such. 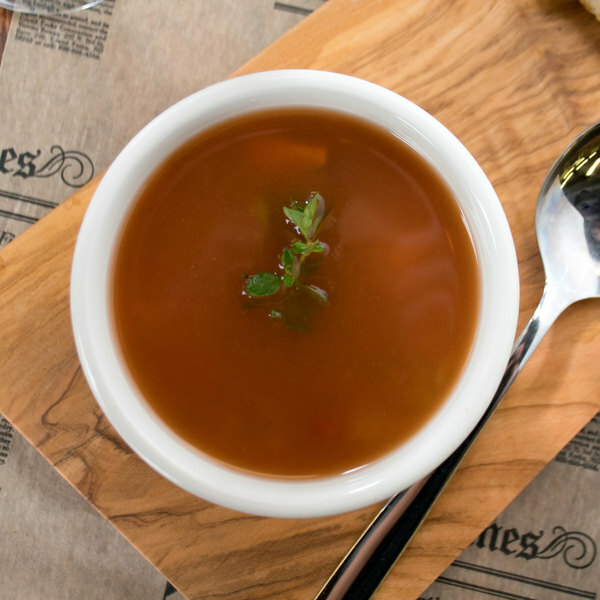 These are just your standard soup cup, great for soup and au jus. They were a little bigger than I had expected, but work great. These are the same size, color and material as oneida brand. they are also interchangable with the existing saucers I had. I would definitly recommend. Great size and durable. Helped our food cost when we downsized from an 8oz cup yet the change went unnoticed from our customers. Looks great on our 9 5/8 plates with a doily, plenty of room for spoon and crax. 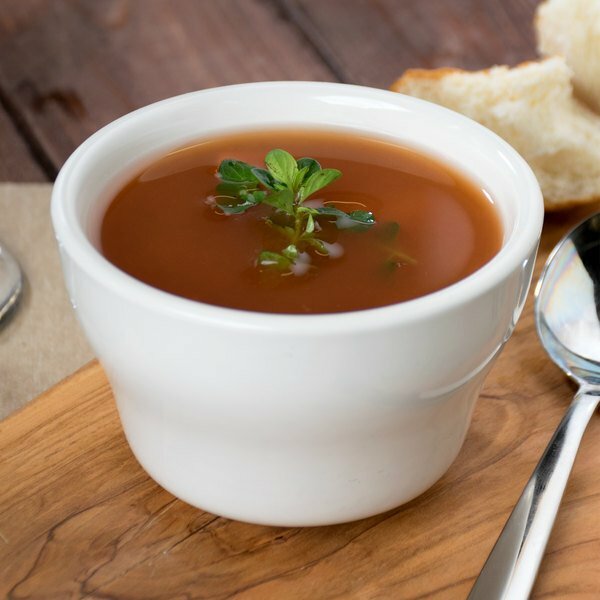 The bouillon cups are a great size for a cup of soup, but also are a great size for sauces and dips. We love them for serving our blue cheese dressing with chicken wings. They are deep enough to dunk. A quality china cup for serving soup or cheese dip in our restaurant. Easy to clean and the finish holds up well after repeated washings. These cups instantly heat up when you put something hot in them which has really extended the time our sides will stay hot once leaving the kitchen. They are also a great size, they give the customer just the right amount of food. CAC China has great products, they hold up very well and look great. We use these bullion cups for sides and soup.